Although I don't have ecaxtly the right figures, I was always interested in the war of the polish succession and the Italian theater of war. Therefore I wrote a Scenario for Parma. A Mezou (Dash.) : Brigade Auvergne – 2 bn.s, 1 art. leg. D : GL du Guerchois (Dep.) : Brig. Picardie – 4 bn.s, 1 medium art. E. GL Châtillon (Dep.) : 2 x Cav. F Savoya : 3 bn.s, 1 art. Leg. H GL de Bonas (Dep.) ? :2 x Cav. I GL Savines (Dep.) ? : 3 x Cav. The battle is a cracking nut for the Austrians. Mercy attacked before he deployed his army properly and was shot early during the first attack at the head of his grenadiers. Please note that Mercy is detached to the 3rd Brigade to give them full speed. For this battle I decide that Generals killed will be replaced always by lower Quality commanders (dep. -> dith.) because so many Austrian generals were killed and these losses and the chaos were important when the prince of Württemberg decided to retreat. Please note that only parts of the Austrian army arrived in time and even the French and Savoy troops joined the fight in a difficult manner. This shows an interesting battle array and not a standard linear deployment. I am interested in discovering more background on this battle. Will you be treating us to a Battle Report on this battle in the future? I will do, when I will have repaired my Austrian-box, which fall down after our last battle (mostly resin-stuff destroyed and broken). There is a really detailed acount in the Austrian book "Feldzüge des Prinzen Eugen von Savoyen. Nach den Feldacten und anderen authentischen Quellen" (1891) vol. 19. Although this book has no OOB of this battle and no maps and I had to deduce from this acount and the French maps on Wikipedia. It's a shame that we don't know much about this war. We know so little about it, that even some historians of my aquaintance said, that there were no battles of any significance during this war. Perhaps that's true for the German wartheater but not for the Italian. I think that this really is a forgotten war. But the battles are interesting. The landscape in Northern Italy was perfect for some cavalry charges although at Parma 1734 it was the same like at Piacenza 10 years later, that the typical italian canals hindered the movement of cavalry and even infantry in parts of the battlefields. That's a very interesting deployment, which should give a challenging game. I look forward toy our AAR. Me, too. All quite intriguing. Ouch! Hope it's not as disastrous as it sounds. For me it's a desaster, because I hate it to repair anything. 1:72 minis are not made to repair. The weapons are too small to glue at the figures and my most expensive Units are made of resin. That's a difficult material. Unfortunately there were my Generals and pandours in the box and what's an Austrian army without them? But perhaps I learned now to be more carefully with the boxes. One Saturday night, I returned home after an exciting game and let a heavy soldier box at the edge of my bed. But let's come to your scenario! It came just on time that I wished to ask more info about the Wars of the Polish Succession! My interest for this "unknown" war was triggered by the book "Bayonets and Scimitars"
After all, Britain was indifferent and France was not totally satisfied from the outcome - so who would bother to write? I have already printed it to read it in the bus, while returning home. Damnitz, you are a scenario machine, thank you for posting and I promise to test this battle the sooner possible! If you do the same with the link you provided for the battle of San Pietro/Parma, one can find that the German text is more detailed! The work from 1891 is detailed in the style like the books about the War of the Austrian Succession from the "k.u.k. Heeresarchiv", although lacking a OOB. If I understand it right fieldmarshall Mercy didn't informed his generals about his plans. He was estranged with the prince of Württemberg, who still was second in command and commander of the army during the absence of the old fieldmarshall. Mercy didn't waited until his army arrived but send his leading units into battle. Early in the battle he was killed at the head of his grenadiers. 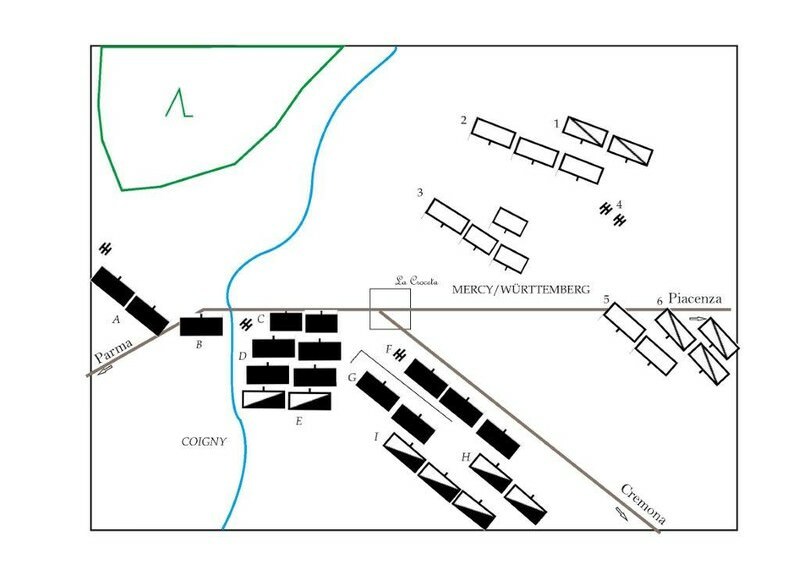 Although many of their troops were not in place too, the French had brought more of their brigades in the position to defend their positions behind the La Croceta-tavern. The battlefield has many walls and hedges, which were used by both sides as strongholds and as places to reform behind them. The French accounts mention the most deadly Austrian volleys which is very interesting as we know from Mollwitz that there the Austrian fire was very weak and could not impress the Prussian advance. It seems to me that the Austrian troops in Italy were of the best quality. It's unbelievable how many attacks were launched with the Austrian infantry at the French center even after Mercy's death. If fieldmarshall Mercy really had a plan how to destroy the French it is'nt clear to us today and maybe it arised from a fault interpretation of the French advance and French plans. Parma/St. Piero was regarded as a really bloody battle. Even some of the French brigades were nearly completely destroyed especialy the Brigade Champagne. The Austrians lost a huge number of Generals who stood at the head of their troops; 1 fieldmarshall (Mercy himself), 2 fielmarshall-lieutenants (FML), 2 GFWMs and many colonels. Perhaps that could be explained with the agressive manner of Austrian assaults. The Austrians lost a fifth of their whole army. The Austrian lost 6237 men while the French lost 3998. I hope to play that on friday. Praetridi Fides. Maybe you happen to know this site. I found maps of the battle of Parma and of many other battles! Thank you. Naturally I used google "Bilder" to search all maps of the battle, but I didn't found one of two of them, which are looking a bit confusing. Nice found indeed. Can you see the map? Maybe I have to upload it again? No, I can't see the map.